Pitonakova, L., Crowder, R. & Bullock, S. (2018). 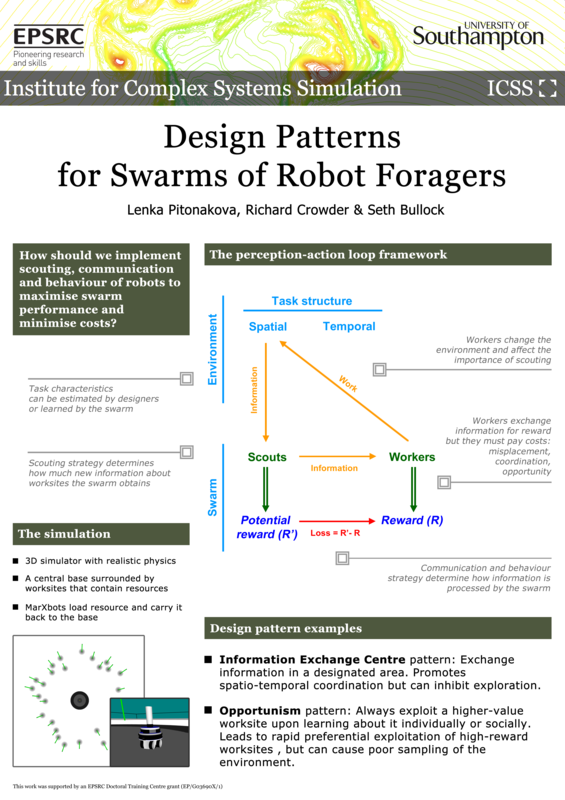 The Information-Cost-Reward framework for understanding robot swarm foraging. Swarm Intelligence, 12(1), 71-96. ﻿Shamshiri R, R. ., Hameed, I. . A., Pitonakova, L., Weltzien, C., Balasundram, S. K., Yule, I. J., Grift, T. E., Chowdhary, G. (2018). 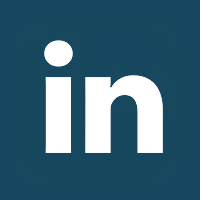 ﻿Simulation software and virtual environments for acceleration of agricultural robotics: Features highlights and performance comparison. International Journal Agricultural and Biological Engineering, 11(4), 15-31. Shamshiri, R. R., Weltzien, C., Hameed, I. 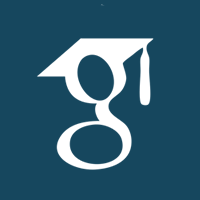 A., Yule, I. J., Grift, T. E., Balasundram, S. K., Pitonakova, L., Ahmad, D., Chowdhary, G. (2018). Research and development in agricultural robotics: A perspective of digital farming. International Journal Agricultural and Biological Engineering, 11(4), 1–14. Pitonakova, L., Crowder, R. & Bullock, S. (2016). Information flow principles for plasticity in foraging robot swarms. Swarm Intelligence, 10(1), 33–63. Wilson, R., zu Erbach-Schoenberg, E., Albert, M., Power, D., Tudge, S., Gonzalez, M., Guthrie, S., Chamberlain, H., Brooks, C., Hughes, C., Pitonakova, L., Buckee, C., Lu, X., Wetter, E., Tatem, A. & Bengtsson, L. (2016). 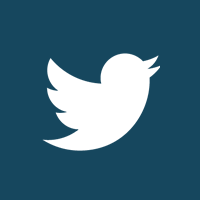 Rapid and near real-time assessments of population displacement using mobile phone data following disasters: The 2015 Nepal earthquake. PLOS Currents Disasters, DOI: 10.1371/currents.dis.d073fbece328e4c39087bc086d694b5c. Pitonakova, L. (2013). Ultrastable neuroendocrine robot controller. Adaptive Behaviour, 21(1), 47-63. Pitonakova, L., Winfield, A. F. T. & Crowder, R. (2018). ﻿Recruitment near worksites facilitates the robustness of foraging e-puck swarms to global positioning noise. Proceedings of the 2018 IEEE/RSJ International Conference on Intelligent Robots and Systems (IROS 2018), IEEE, 4276-4281. Pitonakova, L., Crowder, R. & Bullock, S. (2018). ﻿The importance of information flow regulation in preferentially foraging robot swarms. Proceedings of the Eleventh International Conference on Swarm Intelligence (ANTS 2018), Springer, 277-289. Pitonakova, L., Giuliani, M., Pipe, A., Winfield, A. (2018). 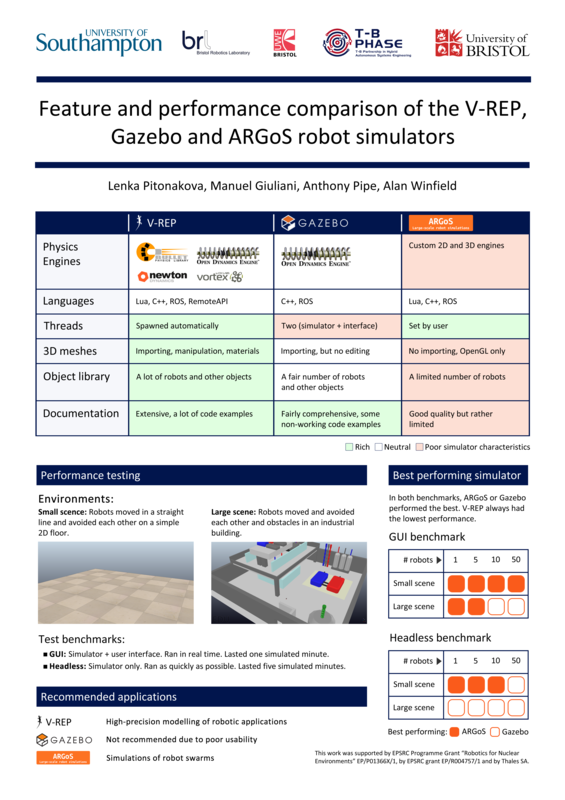 Feature and performance comparison of the V-REP, Gazebo and ARGoS robot simulators. Proceedings of the 19th Towards Autonomous Robotic Systems Conference (TAROS 2018), Lecture Notes in Computer Science, vol 10965, Springer, 357-368. Pitonakova, L., Crowder, R. & Bullock, S. (2017). Behaviour-Data Relations Modelling Language for multi-robot control algorithms. Proceedings of the 2017 IEEE/RSJ International Conference on Intelligent Robots and Systems (IROS 2017), IEEE, 727-732. Pitonakova, L., Crowder, R. & Bullock, S. (2016). 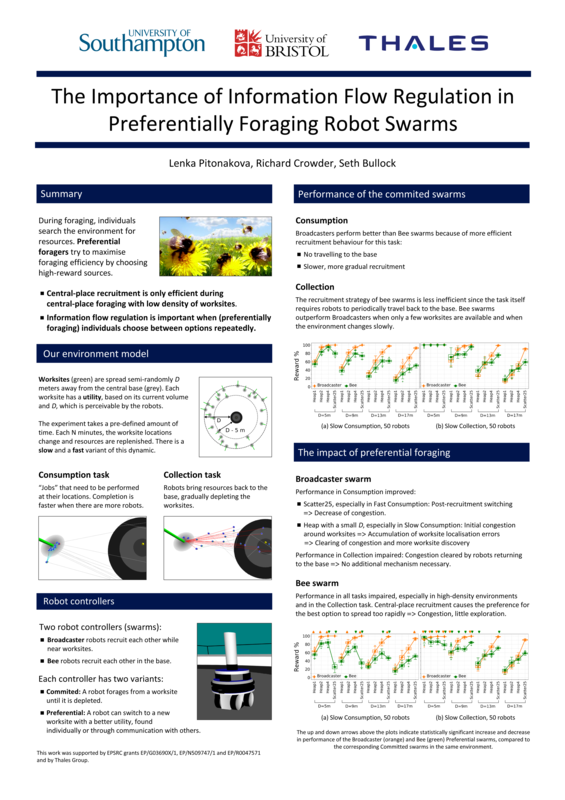 Task allocation in foraging robot swarms: The role of information sharing. In Gershenson, C. et al. (eds. ), Proceedings of the Fifteenth International Conference on the Synthesis and Simulation of Living Systems (ALIFE XV), MIT Press, 306-313. Pitonakova, L., Crowder, R. & Bullock, S. (2015). Design patterns for swarms of robot foragers. Abstract & poster at The International Conference on Intelligent Robots and Systems (IROS 2015), Hamburg, Germany. Pitonakova, L., Crowder, R. & Bullock, S. (2014). Understanding the role of recruitment in collective robot foraging. In Lipson, H. et al. (eds. ), Proceedings of the Fourteenth International Conference on the Synthesis and Simulation of Living Systems (ALIFE 14), MIT Press, 264-271. Pitonakova, L. & Bullock, S. (2013). Controlling ant-based construction. In Lio, P. et al. (eds. ), Proceedings of the Twelfth European Conference on the Synthesis and Simulation of Living Systems (ECAL 2013), MIT Press, 151-158. Pitonakova, L. (2014). Afterword: Rise of the Machines. In: Amos, M. & Page, R. (eds.) Beta Life - Stories from an A-life Future. Comma Press, pp. 37-40. 2017: Designing Robot Swarms: A public lecture at the Southwest Futurists, Bristol. 2016: What is Life? : A public lecture at the Sceptics Cafe, Brighton. 2015: Object Oriented Software Development (In Python): A lecture for members of the Flowminder Foundation and of The World Food Programme.